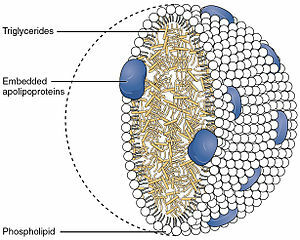 Chylomicrons (from the Greek χυλός, chylos, meaning juice (of plants or animals), and micron, meaning small particle) are lipoprotein particles that consist of triglycerides (85–92%), phospholipids (6–12%), cholesterol (1–3%), and proteins (1–2%). They transport dietary lipids from the intestines to other locations in the body. Chylomicrons are one of the five major groups of lipoproteins: chylomicrons (a.k.a. ULDL ultra low-density lipoprotein relative to surrounding water), very low-density lipoprotein, intermediate-density lipoprotein, low-density lipoprotein, high-density lipoprotein, that enable fats and cholesterol to move within the water-based solution of the bloodstream. Chylomicrons transport lipids absorbed from the intestine to adipose, cardiac, and skeletal muscle tissue, where their triglyceride components are hydrolyzed by the activity of the lipoprotein lipase, allowing the released free fatty acids to be absorbed by the tissues. When a large portion of the triacylglycerol core have been hydrolyzed, chylomicron remnants are formed and are taken up by the liver, thereby also transferring dietary fat to the liver. Chylomicrons are formed in the endoplasmic reticulum in the absorptive cells (enterocytes) of the small intestine. The villi, lined with the microvilli of the brush border, provide a lot of surface area for absorption. Newly formed chylomicrons are secreted through the basolateral membrane into the lacteals, where they join lymph to become chyle. The lymphatic vessels carry the chyle to the venous return of the systemic circulation. From there the chylomicrons supply the tissue with fat absorbed from the diet. Thus, unlike the saccharides and amino acids that digestion liberates from the carbohydrates and proteins of the diet (respectively), the lipids from the diet bypass the hepatic portal system, meaning the liver does not get "first crack" at them. Triglycerides are emulsified by bile and hydrolyzed by the enzyme lipase, resulting in a mixture of fatty acids and monoglycerides. These then pass from the intestinal lumen into the enterocyte, where they are re-esterified to form triglycerides. The triglycerides are then combined with phospholipids, cholesteryl esters, and apolipoprotein B-48 to form a nascent chylomicron. These are then released by exocytosis from the enterocytes into the lacteals, lymphatic vessels originating in the villi of the small intestine, and are then secreted into the bloodstream at the thoracic duct's connection with the left subclavian vein. Nascent chylomicrons are composed primarily of triglycerides (85%) and contain some cholesterol and cholesteryl esters. The main apolipoprotein component is apolipoprotein B-48 (apo B-48). While circulating in blood, chylomicrons exchange components with high-density lipoproteins (HDL). The HDL donates apolipoprotein C-II (APOC2) and apolipoprotein E (APOE) to the nascent chylomicron and, thus, converts it to a mature chylomicron (often referred to simply as "chylomicron"). APOC2 is the coenzyme for lipoprotein lipase (LPL) activity. Once triglyceride stores are distributed, the chylomicron returns APOC2 to the HDL (but keeps APOE), and, thus, becomes a chylomicron remnant, now only 30–50 nm. APOB48 and APOE are important to identify the chylomicron remnant in the liver for endocytosis and breakdown. ^ Mahmood Hussain, M (January 2000). "A proposed model for the assembly of chylomicrons". Atherosclerosis. 148 (1): 1–15. doi:10.1016/S0021-9150(99)00397-4. ^ Smith, Sareen S. Gropper, Jack L.; Smith, Jack S (2013). Advanced nutrition and human metabolism (6th ed.). Belmont, CA: Wadsworth/Cengage Learning. ISBN 1133104053. This page was last edited on 3 September 2018, at 02:55 (UTC).